Responsible mining: Is it possible? Although considered as a significant contributor to the economy of many countries, the mining sector or industry is arguably one of the most heavily criticized industries in the world when it comes to environmental and social protection. It is, therefore, a huge challenge to find an appropriate solution that could balance mining development and environmental performance. A 2003 study conducted by the World Resources Institute reveals that approximately one-third of the world’s active mines and exploration sites are located in intact ecosystems of high conservation values. In Indonesia, it may be difficult to know the exact number and location of mining licenses. A 2004 article in Inside Indonesia written by Dianto Bachriadi suggests that the majority of mining activities occur within the national forest estate (i.e. forest controlled by the Forestry Ministry). Researchers from the Australian National University, in their 2012 paper, estimate that prior to 2000, there were only approximately 600 mining licenses in Indonesia, but by 2010, more than 10,000 licenses had been issued. According to the same study, many of these licenses were issued by local governments and potentially overlap with other permits previously issued over the same area. The mining sector in Indonesia has been blessed with major investments, and along the way continuously contributing to the country’s growth domestic products (GDP) significantly. A 2011 news from Business Wire reports that the mining sector accounted for 10.8% of Indonesia’s GDP in 2009, with minerals and related products contributing one-fifth of the country’s total exports. The same news projects that the industry looks set to post strong average annual double- digit growth of 11.2% in real terms over the forecast period to reach US$149.8 billion in 2015. With the increase in coal and mineral mining’s contribution to the total government revenue (a 6% increase in 2009 compared to 2000), it is expected that mining licenses will be issued in a wider sense. Should this growth continue, without substantial improvement of the level of environmental performance and commitment to social responsibility made by the mining industry, criticisms towards the industry may rise. For decades, many research institutions and environmental organizations have published reports documenting negative environmental impacts of mining activities. In these reports, they argue that land clearing for the development of new mining sites and associated infrastructure is viewed as a direct cause of deforestation and habitat destruction in Indonesia. In particular, the most immediate impact on forests from mining activities is the removal of forest vegetation. One of such reports is a 2000 study conducted by William Sunderlin and Sven Wunder. The study shows that there is a statistically significant relationship between the amount of mineral exports and rate of deforestation in Indonesia during the period of 1976 to 1980. Another study focusing on Papua and Kalimantan, for instance, supports the previous study by stating that gold and copper mining activities in these two major islands had massive environmental impacts on surrounding forests since 1990s. Other reports reveal that not only the development of mining will result in negative impacts on forest but also on other ecosystems and the society. These include contamination of rivers used for drinking water and food supplies, and increasing social conflict over access to mineral resources. With a number of environmental organizations claiming that as of 2005, mining activities have encroached on or threatened 11.4 million hectares of forest in Indonesia, including 8.68 million hectares of protection forests and 2.8 million hectares of conservation areas, an increase in the level of criticisms towards the mining industry appears to be understandable. In this regard, a proactive approach from the mining industry, particularly in promoting the application of responsible mining practices could be seen as a good initial step leading to a credible balanced solution. 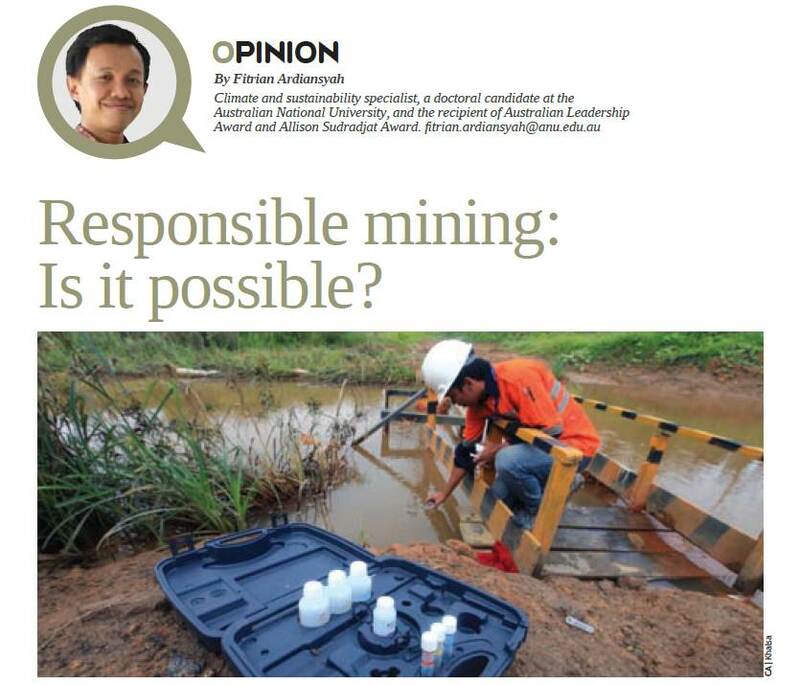 The industry argues that this approach can somehow show that it can leave positive long-term legacies by ensuring the protection of the environment, before, during and after the mining operations take place. A number of different initiatives of responsible mining practices include measures which minimize harm to the environment, recognize human rights and indigenous people’s needs and aspirations, as well as promote greater social and governance accountability. With a varying degree of successes, the implementation of such initiatives has taken place in Australia, Mongolia, Indonesia and other countries. A few environmental organizations and local social development organizations are beginning to embrace the initiative and trying to work together with companies and governments to apply the initiative and monitor it. In a large country such as Indonesia, in which 842 licenses for mining exploration and exploitation have been given between 2005 and 2011 by the Forestry Ministry, covering approximately 2.03 million hectares of forests, the application of the initiative at a larger level and the inclusion of wider stakeholders such as governments, indigenous people and local environmental organizations are likely key to further success of the initiative. If the initiative is implemented only at a small scope or scale, one would argue that any best practices resulting from the initiative may not necessarily be applicable to other areas in the country. If there is a bigger platform endorsed by wider stakeholders supporting the initiative, best practices resulting from it may likely be applicable to other areas or could be magnified at the national level. To be able to undertake and achieve this, trust needs to be developed among different stakeholders, who previously perhaps have negative perceptions toward the industry. Open and transparent discussions need to commence so that any results would be perceived credible and gain wider supports. Another important factor for any responsible mining initiative to be considered as a serious endeavour is that it should also be feeding back to the country’s legal and government system. As Indonesia is reforming its land use and forestry management by issuing a set of different policies, the initiative needs to positively influence this process and be a major counterpart. Using a platform of responsible mining initiative, the mining industry has a good opportunity more than ever to show that not only it has the right intention to contribute to the sustainable development of Indonesia, but also a possible approach to make it happen. Actors in the mining industry, however, need to give wholehearted support to the initiative and collaboratively engage other stakeholders to build trust so that others will be convinced that this is a serious undertaking. If this is the case, responsible mining practices, although it may not be a perfect solution, is likely viewed as the right step towards it.